The laser (Light Amplification by Stimulated Emission of Radiation) was invented in 1960 and since then has become a technology which is indispensable for modern life. Unfortunately, pranksters shining lasers at airplanes are a growing threat to air safety using them to cause flash blindness and distraction. The FAA started tracking laser attacks against aircraft in 2005 counting about 200. Since then the attacks have escalated in both number and intensity to nearly 4000 reported in 2014. I've personally been lased at least a couple of times. Properly used, lasers are essential in applications ranging from communications to navigation, manufacturing, lithography, bar code scanners, and of course entertainment. Most commercial airliners even employ ring laser gyros which are used for stabilization and navigation. I recall using a laser to measure the speed of light in my freshman physics class back in 1977 . We modulated the beam and shot it down to the roof of the cafeteria and back to the engineering building measuring the lag in the returning signal to divide into the distance. Little did I know how new or expensive laboratory lasers were back then. Well as you know, lasers have become quite a bit cheaper since then and pen sized and smaller laser pointers are everywhere. The red dot of a laser pointer could just as easily be coming from a teacher giving a lecture as from cops aiming weapons at a perp. So of course as day follows night, knuckleheads will come up with ways to become a nuisance with their new toys. One of the first nuisance applications of laser pointers was at sports matches. Flashing a laser pointer in the eyes of the opposing team player was a great way to distract or perhaps momentarily flash blind someone preparing to score. Laser pointers are now banned at most sporting and entertainment venues. Having their fun spoiled there, miscreants then turned their lasers skyward towards airplanes. The problem is that being more than just being a nuisance, flash blinding a pilot on approach can have a potentially bad outcome. One problem is that the lasers being used are becoming more powerful. They can not only momentarily distract, but can cause long lasting flash blindness and even permanent retinal damage and burns. And this damage can happen with just a few seconds or less of exposure. High power lasers are readily available through internet sales and present a growing threat. Way back in the 1980s it was the Russians who first used lasers against aircraft. It was during the cold war that the Soviets would stuff ships disguised as fishing trawlers with all sorts of intelligence gathering gear to spy on US military assets. The Navy would then monitor and sometimes harass these "intel trawlers" with P-3 and other patrol planes. Standard cold war cat and mouse game so far. No one got hurt. Then in 1987, it was reported that a US military aircraft, a WC-135, had been "illuminated" with a laser from a Soviet trawler blinding the pilot. Had the other pilot not been momentarily looking down, both pilots would have been blinded. This was only one of many attacks by the Soviets against US aircraft. A subsequent accord signed in 1989 banned the use of military lasers against aircraft but the Russians were back at it in 1997 with another laser attack against a Canadian helicopter in the Strait of Juan de Fuca near Vancouver. So it's obvious that the Russians were using high power lasers that caused permanent eye damage in the pilots and others who were hit. The helicopter pilot and observer in the 1997 incident were permanently grounded with confirmed laser burns to their eyes. Since that time, laser illumination of commercial aircraft has exploded. Only it isn't a foreign military causing all the trouble now but rather homegrown pranksters looking for cheap thrills mostly. Lasers of course have differing power levels and hence ability to blind. Let's take a look at the various types and power levels available to the public. The FDA regulates the sales of lasers in the US. They are classified by color, power rating, and their ability to cause damage to the eyes and skin. Laser pointers rated as Class 1 or 2 are considered mostly harmless. The power ratings are in the 1 to 5 milliwatt range. Class 2 lasers cannot harm the eyes in less than the human blink or look away response of one quarter second. Class 3 lasers can injure the eye even through reflections and must be used with eye protection. Class 4 lasers are high powered lasers which can burn both eyes and skin. The commercially available laser I mentioned above is sold to the public as a class 4 laser with a 2000mW (2 watt) power rating. And I'll admit that while it looks totally badass in a Darth Vader lightsaber kind of way, I can't think of why anyone would need one. Still, for under $300, why not? Just don't aim it at an airplane. That's a felony. This one, by the way, is not available for sale in the US (but is in Canada and Mexico). Distance is also a factor in laser attacks. Laser pointers rated at 5mW can make it difficult to see out an aircraft window at 1000 ft slant distance but their brightness falls off quickly, remaining visible but not producing flash blindness beyond about 4000 ft. It should be noted that laser pointers are generally not considered capable of causing eye injury but only temporary flash blindness and distraction. 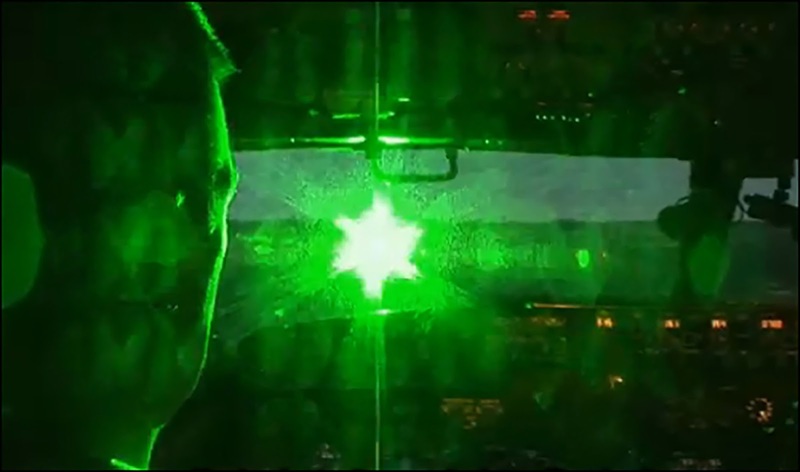 One factor that helps the situation is that it is difficult to keep a handheld laser trained on a moving aircraft which means shorter bursts of light in the cockpit. It is of course the laser radiation reaching the eye which will cause damage and this is measured in microwatts per square centimeter. The type of eye injury a more powerful laser can cause is dependent on its frequency or color and this is due to the light absorption properties of differing parts of the eye. Some lasers burn the retina while others cloud the cornea and lens. And this damage can happen faster than the blink response for powerful lasers. The most dangerous lasers are those producing infrared or ultraviolet light which can damage the eyes but don't initiate a blink response due to the beam not being visible. The Soviets were alleged to have been using these. A safe distance known as the nominal ocular hazard distance or NOHD, describes the distance at which the maximum personal exposure or MPE is achieved. Beyond the NOHD, a laser is generally considered safe if not deliberately stared at. Class 1 and 2 lasers have no NOHD but Class 3 and 4 lasers have an NOHD measured in kilometers...more than enough distance to seriously injure the eyesight of pilots flying overhead. And this has happened recently. Shining a laser at an aircraft is already a federal crime currently punishable by five years in prison, but in a separate law, interference with the operation of an aircraft carries a penalty of up to 20 years according to the FBI. A man was sentenced to a 14 year term last year for shining a laser at a police helicopter in Fresno. The hefty term was considered a breakthrough which will serve to telegraph the seriousness of this crime. The FBI is also offering a $10,000 reward for information on laser criminals. This should do quite a bit to help nab perps as well. The difficult part of catching laser criminals is the ease with which a laser can be shot and then quickly put back into a pocket. Many of the current convictions have arisen from laser attacks against police helicopters which of course have assets on the ground to find and arrest attackers. But with only 141 arrests and 87 convictions since 2004, this crime is easy to commit with impunity. Ongoing education efforts will also help to spread the word that lasers are not toys. Other than counting on concerned citizens actually seeing and reporting lasing incidents, or police helicopters which can pinpoint laser attacks, it appears that not much else can be done. Technology may change that. High resolution airborne cameras may be a possible solution. Dubbed "persistent surveillance" and used in Iraq to spot IED planters, a camera that is always watching the area around an airport might be able to pinpoint the origin of a laser attack and then perhaps even record the movement of the perp back to his house. Perhaps the cameras could be mounted on the bellies of aircraft themselves. I was flying an arrival into Philadelphia from the west a year or so ago and was at perhaps 4000 feet being vectored to final for runway 26R. Over North Philadelphia I noticed a green laser being shone at the airplane from a city street. Being several miles away, the light was not very bright but was very noticeable standing out from the orange streetlights and traffic. After maybe 15 seconds the flashing stopped and we continued on uneventfully. We did notify approach control and filed the appropriate reports. Of course there was no way to even begin to tell what exact street location the laser was fired from. And that was it. We weren't contacted by any law enforcement agency and left it at that. Perhaps the reports are becoming so ubiquitous that follow-up is not necessary. I'll close with this one thought. The vast majority of these events are most certainly low-lifes or pranksters but I'm willing to bet that there are some folks out there intent on doing real damage with powerful lasers. Perhaps stationing two or more attackers to hit a plane from multiple angles with powerful lasers is a potential terrorist ploy. Nothing would surprise me these days. The End of the Commuter Airlines?